Many years ago I was on a panel reviewing a scientific paper for publication. We concluded that one of the calculations in the paper was really superfluous. But it amused us because the calculation produced the answer 42! The number 42 seems to have a strong place in our culture – at least in the English-speaking world. And it’s all down to Douglas Adams, author of The Hitchhiker’s Guide to the Galaxy. (If you don’t understand my point about the number 42 – read the book). Big Thinkers – Douglas Adams [Author] – YouTube. 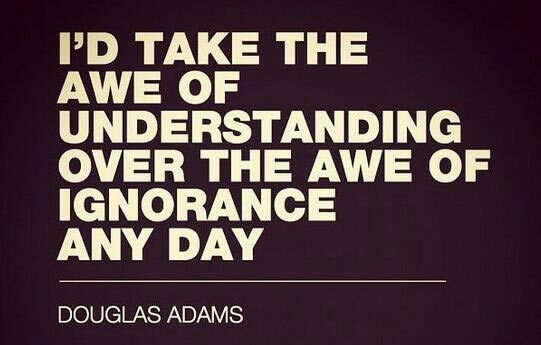 Another source of Douglas Adams’s wisdom are the many quotes he left. Some of these (quite a few actually) are collected at Goodreads. I have always found arguments from analogy very weak. Especially as they are usually allied with strong preconceived beliefs and amount to nothing more than attempts to “prove” those beliefs. Typical is the “argument from design” for the “proof” of existence of gods. You know – Rev. Paley and his discovery of a watch on the heath? It’s amazing how many of the anti-scientific arguments used by today’s creationists follow the same lines. A huge elephant in the creationist design room is their comparison of living forms with inanimate manufactured objects. “A watch has a watchmaker therefore an animal must also have a designer/maker.” Similarly the current intelligent design (ID) proponents who insist that a biological cell is an intricate machine – hence it must have a designer/creator. This approach is so inappropriately mechanical. One could never come to understand living forms, or their origins, by insisting on treating them like inanimate machines or objects. Of course the design argument does raise the question of how and where this design, and the inevitable creation, of live animals occurs (or occured) and where the animals are (were) manufactured. You can’t have it both ways – claim “design” and “creation” and then just ignore those events. But the approach does provide some humour. Remember the manufacturing plant for planets in Douglas Adams‘ “Hitchhikers Guide to the Galaxy“? 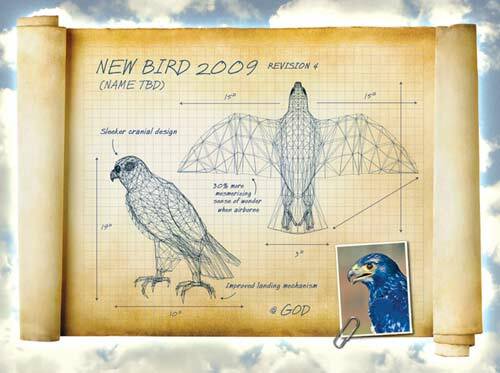 Now the satirical web site The Onion has a spoof on God’s creation of a new bird species. Dressed up like the reporting of a new model of car (see God Introduces New Bird ).